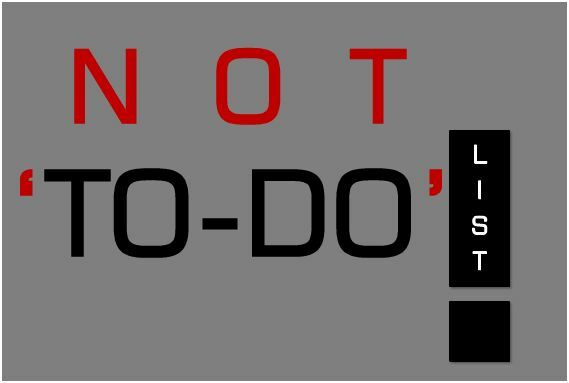 Do You Have NOT To-Do List? do you keep any “not to do list” for yourself? If yes, what activities, situations, places or perhaps people are you consciously avoiding? Over to you now. See you in comments. When I was like 15 I’ve made a promise with myself, that I will never ever have a boss. That I will always be self-employed. Something similar as Martin – never become a (regular) employee… I worked only once and it last for a week (instead of two weeks, I quit after 5 days :)). And you are so walking your talk, Waqas! Brilliant, keep it up. 1. dwell on past bad memories. 1. When I am 20, Not to do anything by other’s advice, I will consider them but at last descisions are made by me; so that I can be sure of that whatever results comes, it is because of me and not by any of my friends, relatives or others. 2. When I am 27, Not to do Smoking and Drink Alcahol . 4. When I am 29, Not to Watch TV a lot. Thank you for your premiere comment on #IS -> welcome to SCG. Wow, that is pretty impressive not to do list & I must say that all of your NOT to dos are the same as mine.